Learning the family recipe from my mother in-law. My mother in-law made it look easy. 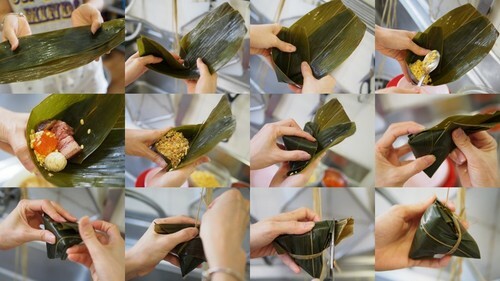 The most difficult part was wrapping the dumpling. It needs practice to get right. A day before clean and wash the bamboo leaves. Boil them for 15 – 20 minutes and soak in the pot overnight together with the hemp string. Fry shallots in the oil over medium heat till lightly golden brown. Remove shallots and some oil out from the wok if you do not want the dumpling to be so oily. 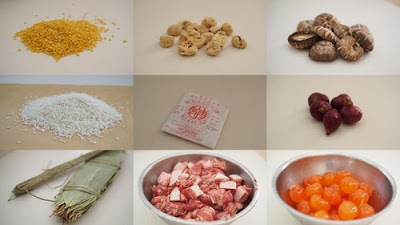 Add glutinous rice and salt. Stir till thoroughly heated and mix well. Transfer to a big bowl. Wash, clean and cut the pork belly. Make sure there is no hair left on the skin. Marinate with five spices powder and salt for 5 hours or more. Heat oil in a wok and brown the pork belly slightly for few minutes. Does not need to be fully cooked. Squeeze excess water out of mushroom. Heat oil in wok, fry garlic till fragrant, add in mushroom, soya sauce and sugar. Add a little bit of water and stir fry for few minutes. Fill with glutinous rice (1 tbsp or more), green gram (1 tbsp), add a pork, a mushroom, half a egg yolk, a chestnut, green gram (1 tbsp) again and cover with glutinous rice (about 1 tbsp) to the top. 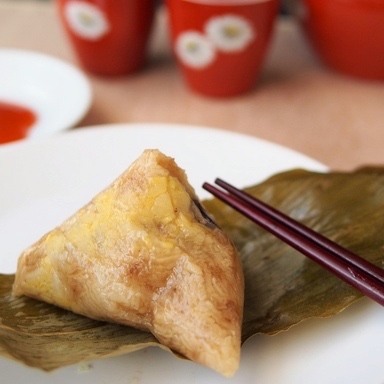 Lightly press and fold the remaining part of the leaf over the top of the cone and form into the shape of dumpling. Wrap up the leaf and seal tight with hemp string. Bring a large pot of water to boil. 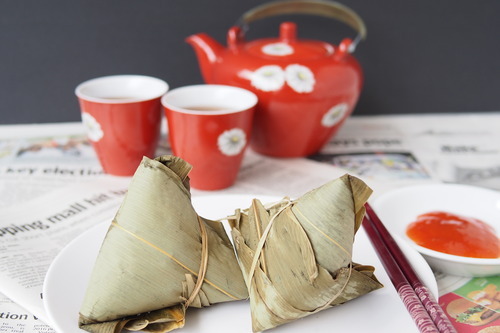 Place the wrapped dumplings into the boiling water and cook for 2 hours over a medium slow fire. Constantly top with boiling water to maintain level of water. Make sure the entire dumpling is submerged in water. After 2 hours, remove from the pot, drain, let the dumpling cool and enjoy.